Home Assets What are Fixed Assets? In accounting, fixed assets are assets which cannot be converted into cash immediately. These are mainly tangible assets used in production having a useful life of more than one accounting period. Unlike current assets or liquid assets, fixed assets are for the purpose of deriving long-term benefits. Intangible assets like trademarks, patents, goodwill etc. Fixed assets are “fixed” not because of their geographical fixity. They are “fixed” in the sense that they are not completely consumed during production activities in a single accounting period. 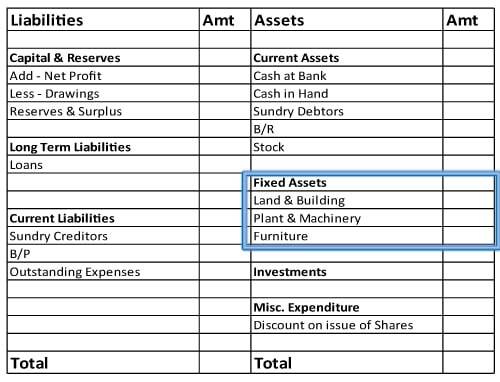 Where are Fixed Assets Shown in Financial Statements? Fixed assets are shown on the “Assets” side i.e. Right hand side of the vertical balance sheet. They are shown in financial statements at their net book value, calculation for net book value has been shown in the next section. In Balance sheet, fixed assets are recorded under Property, plant and equipment section. Although these assets are available in the production process for several accounting years, with time and usage, they depreciate, i.e., they lose value. That is why; fixed assets are recorded at their net book-value, which is the difference between historical cost of the asset and accumulated depreciation. 30,000 – (3 x 2,000) = 24,000.